Relax and unwind at Pelican Waters Holiday Park on the banks of the Moyne River, Port Fairy. Here you will enjoy a peaceful rural setting with spectacular river views, all within a 5 to 10 minute walk to shops and restaurants, and 15 minute walk to beaches and the fisherman's wharf. Not your ordinary holiday park. On the banks of the Moyne River and with views to Belfast Loch, your secluded holiday accommodation is surrounded by gardens and expansive lawns yet within an easy walk to East Beach, Port Fairy Centre and the Port Fairy Wharf. PELICAN WATERS VILLAS are fully self contained with 2 bedrooms, fully equipped kitchen with dishwasher, reverse cycle air conditioning, outside deck with spectacular river views. Looking for something special for your holiday? PELICAN WATERS TRAIN is fully self contained with 2 bedrooms (sleeps 6), fully equipped kitchen with dishwasher, digital tv, air conditioning and a large deck. PELICAN WATERS UNIT offers 3 bedroom fully self contained accommodation, 2 queen plus 1 single accommodation (sleeps 5) with spectacular river views. Features fully equipped kitchen, reverse cycle air conditioning, family room, and spa bath. 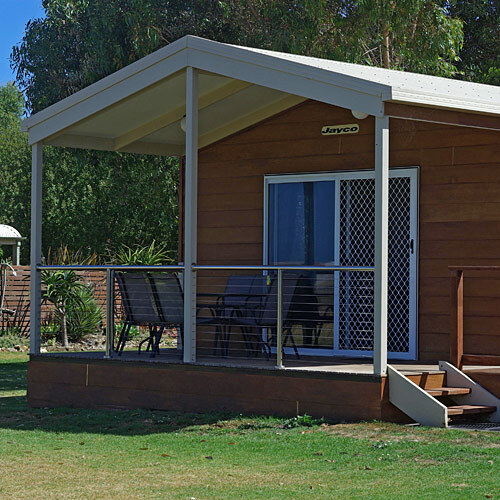 PELICAN WATERS CABINS are fully self contained 2 bedroom accommodation with rural views. Fully equipped kitchen, reverse cycle air conditioning. Sleeps 5. PELICAN WATERS Accessible VILLA is fully self contained with 2 bedrooms, fully equipped kitchen with dishwasher, accessible toilet and shower, reverse cycle air conditioning, outside deck with ramp and spectacular river views. PELICAN WATERS LODGE, a fully self contained 3 bedroom house that is perfect for a family of 6. New fully equipped kitchen with dishwasher, 2 queen and 2 single beds, bath and shower and laundry facilities. Rural setting.